Coventry Village is home to over 45 independently owned businesses in one walk-able quarter-mile. Small business Saturday is Saturday, November 25th. We ask you to join us for the day and shop, dine and enjoy LOCAL with us. ❅ Shop Small & Earn Coventry Cash (12 PM - 6 PM) For every $50 you spend, on a single receipt at a participating Coventry Cash location, you'll get a $10 Coventry Cash coupon you can spend in January. 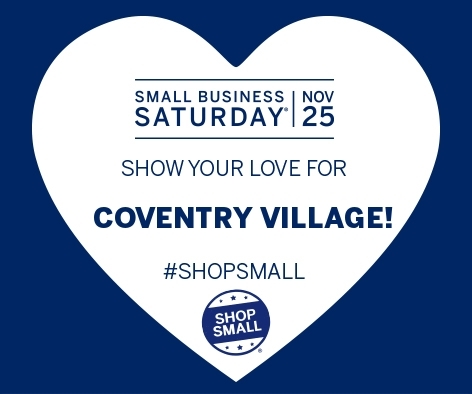 To redeem, simply take your qualifying receipt to the Coventry Village Ambassador table located outside the main parking garage. Learn more here. ❅ Ride the Bluelink Shuttle, FREE from 12 PM - 6 PM and visit more small businesses in Little Italy and University Circle. Learn more here. ❅ Mac's Backs Books on Coventry is celebrating Small Business Saturday with author book signings, book and merchandise raffles, other specials and sweet treats throughout the day. Enjoy 10% off new hardcover books and 10% off literary tees. Learn more here. ❅ City Buddha - Small Business Saturday Sale: Fashion earrings buy four, get one free + 10% off everything with a Buddha + 25% off silver bracelets, pendants and earrings. Follow City Buddha on Facebook for updates all throughout the weekend. ❅ Chipotle Mexican Grill - Fuel up at the Chipotle location in Coventry Village on Sat. November 25th from 10:45 AM - 10 PM. Show your receipt from a small business in the neighborhood, they reward you for with buy-one, get-one burritos, bowls, tacos, or salads. *Certain restrictions apply. See location for details. Not valid with other promotional offers. One BOGO per valid ID.